For collectors of inspirational quotes, the ecstatic poems of the Persian mystic Rumi are pure gold. I find most of my favorites in one of the finest anthologies of Rumi’s work, The Soul of Rumi, translated by the incredible Coleman Barks. 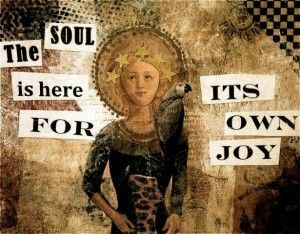 “The Soul is here for its own joy” is such a powerful line that I just had to use it in a collage earlier this year. Click on the images for a detailed view. You’ll note that the dress was assembled from magazine ads and scraps of wrapping paper. 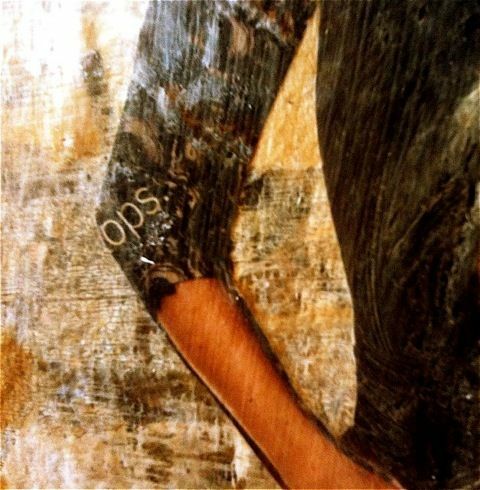 The word “ops” appears on the elbow of the figure. This was totally unintentional; I didn’t notice it until after I layered another coat of glaze on the piece. Talk about a message for a recovering perfectionist! 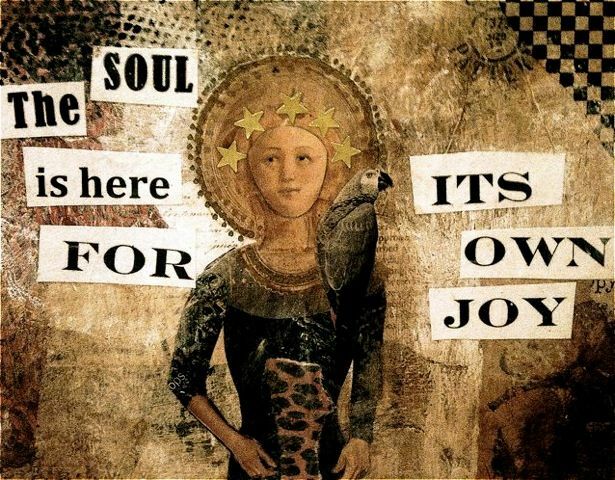 This entry was posted in My artwork, Poems to inspire and tagged inspiration, mixed media collage, Rumi poems, The Soul of Rumi by Coleman Barks by Cindy La Ferle. Bookmark the permalink. Brava, Babe! I am in awe of your talent. Blessings. I don’t know if I’ve mentioned here it in the past, if I have please forgive my forgetfulness. I graduated from UGA and had a writing class with Coleman Barks. I loved him and not just because I received an A in his class, but because he was such an interesting person. He wore flip flops and wrinkled shorts and he wrote his notes on napkins at the local Waffle House restaurant. Have you heard the recordings of Coleman reading Rumi’s poems? He has a great voice. Even though it was 25 years ago, I still have a paper that I wrote for his class with his grading and notes on it. Oops! I got so excited about Coleman Barks that I forgot to say that your art is stunning! I love it. Elizabeth, you didn’t tell me about your Coleman Barks experience before, and now I am insanely jealous, envious. What an amazing experience that must have been. I attended a reading he did years ago with Robert Bly — a wonderful moment. I just ordered a new Rumi book — a poem a day with Rumi sort of thing — edited by Barks. Can’t wait. Thanks for sharing your story! an inspiring and uplifting piece of visual art! And ONLY a perfectionist would point out the “ops.” I would have never noticed it. Well, maybe many viewings later and then I would wonder what enigmatic thing you meant to say. Cindy, I LOVE it! The message itself just floored me. Then I smiled at the “funky sacred” look of the whole piece. Very cool. I’ve got a Rumi link on my sidebar- love him. I love that piece – seriously. Cindy H — Thanks so much. I like your description, “funky sacred.” That works for me! hmmm…starlife, coleman Barks, Rumi and now YOU!. I’m so happy to be here, talking with you and….allowing myself (my soul) the space-time to experience joy. Candee, I am happy to see you here, and am very excited to discover your work as well (thank you, Starrlife!) Like you, I am intrigued by the connection between art and writing. I’ve always loved both. When I am blocked, or just can’t figure out what I have to say on paper, I always head upstairs to the art studio and start making something, anything. Shifting to a different medium always helps.